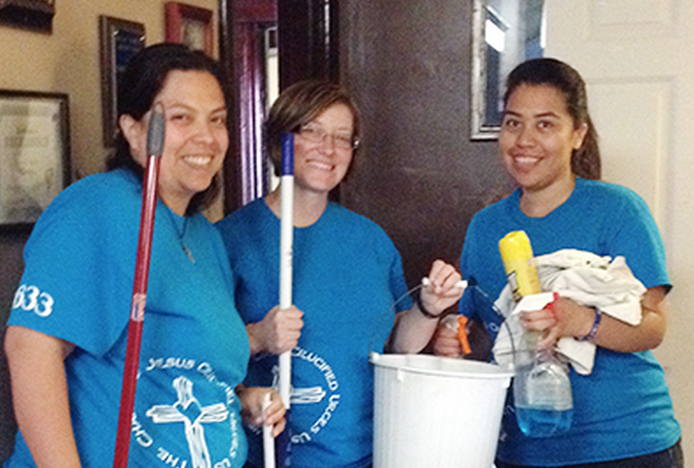 Michelle Hoffman is a discerner with the Daughters of Charity. She shares what has been integral to her discernment journey. Please join us in praying for Michelle as she discerns God's call. As I have been discerning my call to religious life, a song by Matthew West called "Do Something" has really stopped me in my tracks. There are days I wake up and think about all the problems in our world and why God lets those things happen. If I want to make a difference in the world then I need to stand up and "do something." That's exactly what I got to do for a week with the Daughters of Charity on the Search and Serve retreat in East St. Louis, Ill.
During this week we spent time in prayer and reflection but also got to "do something" about the problems of this world. We served at St. Vincent de Paul Parish where we truly saw a variety of Vincentians working together serving lunch and dinner to the poor, making care packages for the homeless and giving away clothing. We also visited social service agencies, cleaned a bus transformed into a good truck for the homeless, and visited and cleaned a women's shelter. at a women's shelter during Search and Serve 2014. It was great to see people every day "doing something" to alleviate some of the pain in this world. This one week helped me open my eyes that I want to do more than I have been to serve the poor because, yes, one week helps, but it's an everyday problem. I want to be part of the solution and do something instead of doing nothing. Through my discernment journey I have been looking for a religious order that serves the poor in many different ways. The Daughters truly embody service to the poor in everything they do. Through this week I saw how the Vincentian charism is lived out, not only through Daughters of Charity but through the Congregation of the Mission, Society of St. Vincent de Paul and Ladies of Charity. Those who embody this charism show dignity and care to each person they come in contact with, just like they are meeting Jesus. I know now I am being called to "do something" with my life by applying to become a Daughter of Charity. Who wants to change the world with me? Together, with Christ, we can change the world.